Today’s tradition for having a Christ-centered Easter is about the eyewitness of Jesus Christ, Thomas, and lillies. Enjoy! Have you ever made marshmallows? Did you even know that was possible, or did you think they only come from the store? They are a super fun Easter treat! They also provide a great lesson in kitchen chemistry. It is sooo much fun to watch water and gelatin and sweetener whip up into this glossy white sticky substance that then turns bouncy and squishy! Lots of different recipes abound. I like the simpler recipes that use four or five ingredients. When you do homemade you can eliminate the white sugar and the corn syrup. Great news! Here’s one with honey, from the Urban Poser. Honey Sweetened Marshmallows (GAPS, Paleo, SCD) from The Urban Poser on Vimeo. Here’s a Trim Healthy Mama version, using erythritol. I don’t think erythritol is good for long term, but for losing weight, it has its place as a substitute for sugar and honey. In the THM lingo, marshmallows are a FP candy, which means you can eat a lot of them! If you want to add some fat (thus making them more satisfying, into a THM S treat) dip them in homemade chocolate and let harden. Yum! Today’s tradition for a Christ-centered Easter involves contemplation about the scriptures that bring a witness to you of the divinity of Jesus Christ by the Holy Spirit. This tradition is inspired by the disciples of Christ who walked with Him, in His newly resurrected body, on the way to Emmaus. Even though they saw Jesus right before them with their very eyes, they did not know who He was until they felt the Spirit bear witness, because Jesus quoted scripture to them. So what scriptures bring that witness to you? Does your family know what they are? Take this opportunity to talk about them, write them down, and display so your family knows. Thank you Emily Freeman and David Butler, for this inspired tradition. It’s so simple yet profound! I don’t know who first came up with the idea of eating chocolate at Easter time, but I love doing it! Not just at Easter, but every day! What better way to be reminded of the sweetness of the gospel of Jesus Christ at Easter time, and every day, than to eat chocolate?! Right?! The great news is, you can make your own sugar-free chocolate if you don’t want to gain weight by eating all the sugary kinds. You can get fun molds from Amazon for different holidays too! But first, here’s the non-purist, super easy way, to make it into fun Easter shapes. Do this if you or your kids don’t have weight-control issues. Melt chocolate chips in a glass bowl over a pot of water that you boil. You could also use stevia sweetened chocolate chips. Then pour the melted chocolate into candy making molds. Use a pipette to make it less messy. In a glass bowl over a pot of boiling water. melt 1 cup cocoa butter or coconut oil, (I prefer cocoa butter, it tastes better, but I use coconut oil when I’m out of cocoa butter. Cocoa butter is harder to find in regular grocery stores. You can find it on amazon or at natural health food stores). The picture below shows cocoa butter chunks as they come from Amazon. While the oil is melting, decide where to put the chocolate when it’s ready to form. If you want to be fun and fancy, for Easter, use chocolate molds from Amazon or a hobby store, and a pipette. If you don’t want to be fancy, use bread loaf pans lined with parchment paper. The parchment paper makes it easy to lift out the chocolate after it hardens so you can then cut it into chunks. Here’s what the cocoa butter looks like after melting. Mix all the dry ingredients together in a parchment paper-lined loaf pan. Taste this chocolate powdery substance. Add more salt or more stevia to adjust taste to your likeness. Once it is perfect, add the melted oil. Add essential oils or vanilla extract if you want. I have tried peppermint and orange oils and loved them. The Trim Healthy Mama Natural Burst Caramel Extract Flavor was super yummy as well. Freeze for a few hours. Than pop out of molds or cut into rustic chunks and store in a glass jar if your house isn’t too warm. If it’s warm, above 72 degrees F, store in the fridge. Here’s a super simple way I am currently using Come, Follow Me. What makes it super easy is that you tack it onto a habit you already have, which is eating! Use this over dinner or whatever meal you commonly share with your family. If you don’t commonly share a meal, then fix a bowl of popcorn or some cookies and sit down to enjoy a snack or dessert together. 1. First, I do one of the following. I either briefly tell one of the stories from the weekly assigned reading to my children in my own words. Then I show my kids a Bible video on my mobile device, if there is one to go with it. These videos are usually included in the lesson for Come, Follow Me. If you can’t find any videos in the guide for “Individuals and Families” check the guides for Sunday School and Primary. Here is the full playlist. I read the scripture passage mentioned, or we take turns reading each verse, and I ask the kids a question to turn their brain on into “seeking” mode. It’s super important to ask a question before we read, to get them to pay attention. Like for example, we just read one of the passages mentioned in the Easter lesson, 1 Peter 1:3-11. I asked the children before we read, “What words or phrases do you notice as we read that give you a sense of hope?” I briefly scan the section mentioning the scripture passage, to find a question I can ask to get the kids in “seeking” mode. That’s how I found the question about hope. 4. Lastly, I love to write down their answers in a special pretty notebook I have dedicated for our Come, Follow Me Family Study Journal. (Hint: Ross Dress for Less Stores has pretty notebooks for only $2.99! I love them because they are hardbound, have a spiral binding so I can attach a pen with a clip inside the coil, and they often have a scripture printed on the cover.) This is becoming a treasured family keepsake as the kids tell me things I’ve never heard before. I am getting delightful peeks into their souls. The past two Thursday nights I’ve had two book club discussions, one online and one in person. I loved every single minute of them. For the first one we discussed Little Women, and for the second one we discussed anything by C.S. Lewis. I looooove Sarah Mackenzie’s idea to make your child’s reading life (whether or not you homeschool) less like school and more like a book club. It’s all about food and connection. Doesn’t that sound wonderful? One of my new online book club friends expressed how much she loves that particular phrase “for love conquers fear, and gratitude can conquer pride.” So then I asked the ladies if they had ever experienced a time of love conquering fear, or gratitude conquering pride. What followed was a delightful peek into the soul of those who shared. Want to know more how to create a book club culture in your family? Sarah can help. 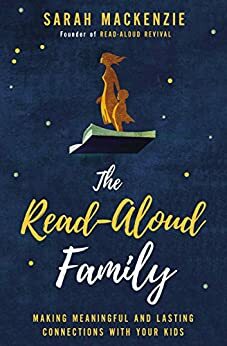 Here is Sarah on her podcast reading aloud Chapter 6 of her book, The Read-Aloud Family, about creating a book club culture at home. I have one kid in particular who would be very motivated to read and discuss a book if I told him we would go out for a hamburger date to discuss the book when he is done reading. I am going to do this! Why didn’t I think of this before?! I’ve done parent mentor dates before, going out to eat, but I didn’t think of using it as an opportunity to discuss a book. You don’t even have to have read the book yourself, as Sarah teaches. Here is a brief summary of what Sarah teaches, over here. Today’s tradition for a Christ-centered Easter is so lovely. It comes from Serbia. In the video above, Emily Freeman says that her son learned about this tradition on his mission. In Serbia, for a long time it was illegal to believe in Jesus Christ, according to Emily in the video. Watch it to learn about the tradition of how Serbia, red Easter eggs, women and Mary Magdalene all connect. This web site here says that Good Friday is the day when Serbians traditionally dye their Easter eggs red to prepare for Easter Sunday. So I am going to do that tomorrow, after our Shakespeare play practice! I love how easy this new tradition will be for me! I’m also going to invite Grandma to share her testimony of Christ with us via Zoom.